Shop online for 107 hobby and model paint brushes at discounts up to 39%. Atlas Brush Co. is ranked #1 out of 11 hobby and model paint brushes manufacturers, followed by Brushes, and Testors. This is the #255 Golden Taklon Round Detail Paint Brush Set from Atlas Brush Company. 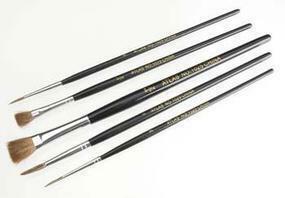 This is the Testors Three Brush Set Including One Pointed, One Flat and One 1/4" Tips. This is a 3-piece Red Sable Brush Set from Atlas Brush Co., Inc. This is a 4 Piece Taklon Round Brush Set by Atlas Brush Company. This is the Size 6 Synthetic Round Brush Hobby and Model Paint Brush by AK Interactive.